51 Republican senators and 220 House Republicans voted to murder bear cubs in their dens, to import ivory from elephant massacres, etc. 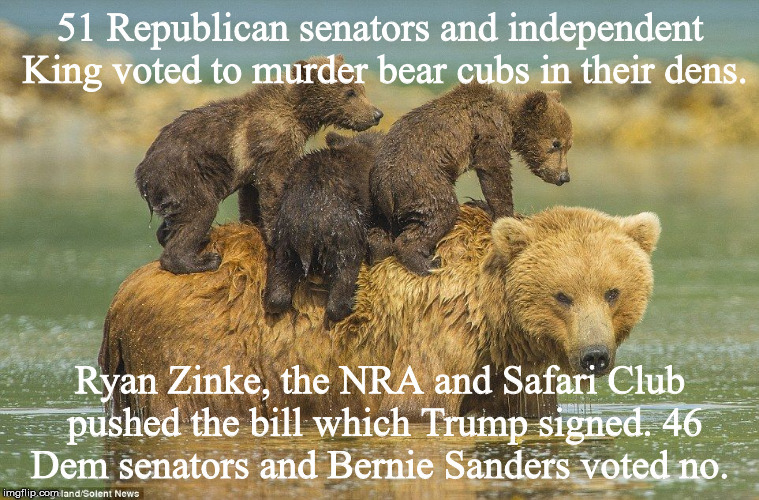 voted to slaughter bear cubs in their dens while 46 Democrats and independent Bernie Sanders voted no. inside fences shot as easily as innocent fish in a barrel). The law allows the murder of bear cubs in their dens. It allows them to be lured by food to bait stations at which they can be blown away. It allows the import of the ivory of massacred elephants. slaughterhouses, laboratory research on animals etc. and independent Bernie Sanders voted against the murder. It was initially introduced by Don Young, GOP, Alaska, often named the worst enemy of innocent animals in the House. and November, as well as every Republican in the House. while Democrats, 183, voted no and 5 voted yes. 1 baby cub, nicknamed Teddy's bear, now teddy bear, than for the hundreds he murdered. to bait stations to be blown away. scheduled a grizzly bear hunt. 300 different SPECIES of animals.